Hollander was never less than a skilled poet, and at his best a very fine one. He also had intelligent things to say about the relation of poetry to music, among many other subjects. In the 80s he recommended some poems of mine to the late Ben Sonnenberg of Grand Street, resulting in my first published poems. I met him only once. In June I attended the “translators’ coven” organized under the auspices of the Russkiy Mir Program of St Antony’s College at Oxford. There were about thirty short presentations by Russian-English literary translators, discussing recent or current work. Some 125 people attended the two-day event; many, both presenters and audience, were also in London at Pushkin House for a series of evening readings/discussions the following week. My presentation was on “translating classic Russian verse drama for performance,” in which I discussed my approach to translating Pushkin and Griboyedov. With me on the drama panel, chaired by Sasha Dugdale, were Lisa Hayden and Noah Birksted-Breen. A full summary of the proceedings is here. Presentations were mostly informal, with ample time allowed for open discussion. Being a very infrequent conference-goer, I don’t have much basis for comparison, but the general level seemed to me very high. Literary translation tends to be solitary, despite the obvious benefits of collaboration (a point that arose more than once in discussion), and the collegiality of the gathering felt quite remarkable. The socializing around the conference, including a restaurant dinner for about 40 the first night (and a bit of pub crawling afterwards) didn’t hurt, either. I was only able to attend two of the Pushkin House events in Bloomsbury. The first was devoted to three recent winners of the Brodsky-Spender Prize, Irina Mashinski and Boris Dralyuk for their translation of Arseny Tarkovsky’s “Field Hospital” (First Prize), and Alexandra Berlina for her translation of Brodsky’s “You can’t tell a gnat” (Third Prize). The second night was devoted to Mandelstam. The panel, led by Robert Chandler, included Victor Sonkin, Irina Mashinski, Boris Dralyuk, Alexandra Berlina, and Peter France, several of whose very fine translations of Mandelstam were read alongside other versions for comparison. Aside from all this, it was my first visit to London in about a decade. I stayed in the East End, in Stepney Green, an area I was not familiar with. 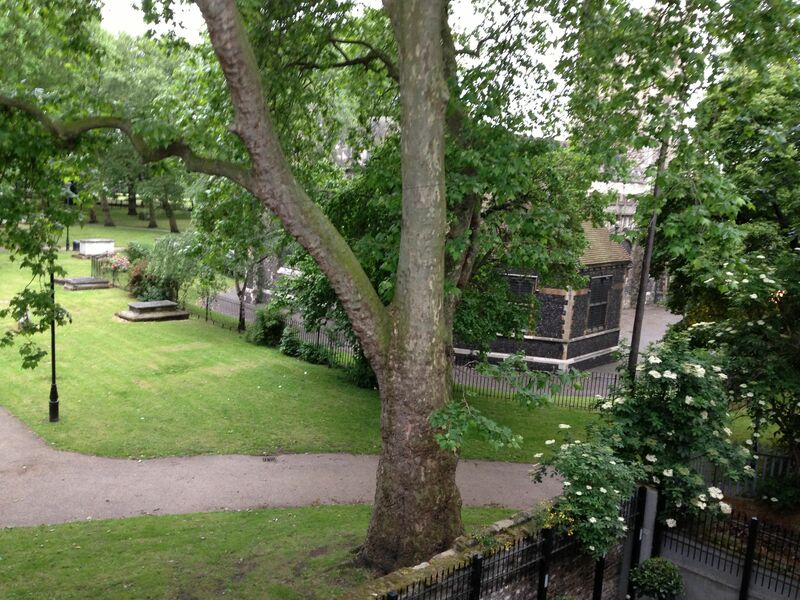 The flat where I was staying looked out over St Dunstan’s churchyard (below). The church’s bells (“the bells of Stepney”) are among those mentioned in the “Oranges and Lemons” nursery rhyme about the bells of East London. You are currently viewing the archives for August, 2013 at Spoken and Sung.